If you’ve heard the term ‘CSR’ but don’t know what the buzz is about, don’t worry, we’ve got the answers. CSR, or Corporate Social Responsibility, is one of the fastest growing types of nonprofit fundraising in the industry. According to Giving USA, corporations gave $22.77 billion to charities in 2017. Philanthropic giving has become a pillar of industry in the last decade, and companies are building entire teams and programs around CSR initiatives. Nonprofits can thank Millennials and later generations for the rise of CSR. The first thing you might be asking yourself is ‘How did CSR become such a big deal?’ or ‘Did CSR just arrive out of nowhere overnight?’. While the answer to the latter question is, of course, no, it might seem like CSR is a bit fad-like for established nonprofits or corporations. This is due in some part to the rise of Millennials and Gen Z workers bringing their values and worldviews to the workplace. Over 88% of Millennials believe their employers should help address social issues, while nearly 55% of consumers will pay more for products provided by socially responsible companies. The world as a whole is turning a sharper eye to corporate actions, and CSR delivers both internal and external value to these companies. There are various types of CSR initiatives, and not all of them involve donations. For nonprofit teams, it can seem like the day-to-day agenda just involves asking for money. CSR initiatives break away from this cycle and help build ong-term corporate sponsors and donors. Besides financial donations, other types of CSR involvement include volunteer events, match-in-kind donations, and even one-off services, such as accounting or marketing. It’s actually easy to get up and running with a CSR program – trust us. Come up with an idea for your program and write it down. Be thorough! Pick your CSR leadership committee and hold people accountable to goals. Build a list of the corporations and businesses to target. Look for ones with similar missions and values for the best fit. Create your CSR program pitch with specific attention to clarity and transparency. Pitch your idea to potential partners with an emphasis on what they stand to gain. Start marketing and promoting your initiative to build amazing press for both your team and your corporate partner. Collect metrics and data in relevant areas and report back to your partners to demonstrate impact and success. But CSR also involves a good amount of data gathering for corporate partners. As CSR has grown, so has corporate education. Companies need to know how they stand to profit by partnering with your organization, what requirements both sides will be held to, and how your nonprofit will impact the partnership. CSR partnerships are a two-sided agreement, and this means both parties need to bring something to the table. Your team can incorporate CSR into any of your current fundraising campaigns. One common thing we hear from nonprofits about CSR is ‘We’re too busy with other campaigns to worry about corporate donors’. Trust us, you want your piece of this pie – corporate giving increased by 8% in the US in 2017 and shows no signs of slowing down. Think of CSR as an added benefit to your current campaigns, such as peer-to-peer events or online auctions. Adding a dose of corporate involvement might even help gain new donors and increase your attendance at other events throughout the year. There’s no time like the present for your team to get a jump on CSR programs. 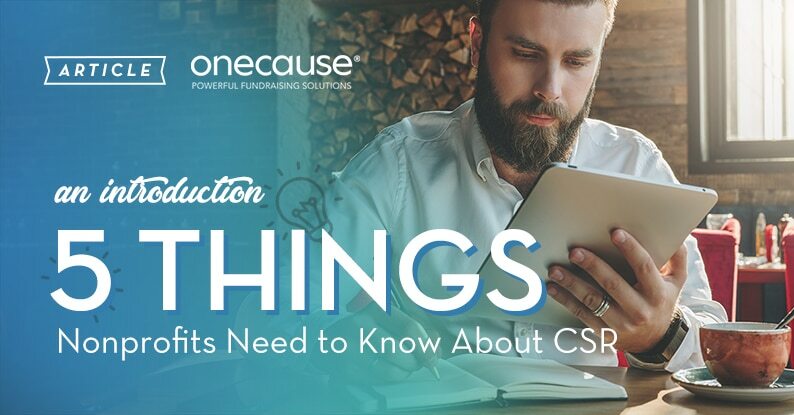 You can get a detailed look at CSR initiatives with our new guide, “A Nonprofit’s Guide to the World of Corporate Social Responsibility”, or take a test drive of OneCause here.